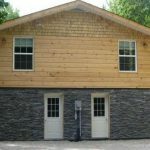 With three bedrooms and a gorgeous open cathedral concept this is the perfect cottage for the whole family! With its pine-finished interior walls and ceilings, this chalet makes a nice and cozy retreat. 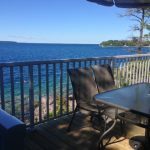 Imagine waking to the splash of the waves on the shoreline, enjoying your morning coffee looking out to the many islands. 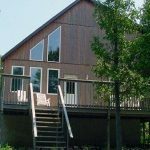 That is the experience that awaits you at our four bedroom Waterfront Cottage. 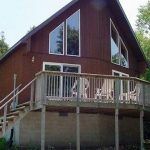 This beautiful cottage has three bedrooms and two full size bathrooms. Two of the bedrooms have one queen size bed, and one bedroom has a bunk bed with two double mattresses, and one single mattress. The living room has two pull out couches as well. 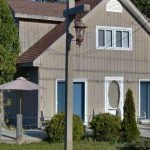 This cottage has three bedrooms, one and a half bathrooms, a fully equipped kitchen, dining room table and large living room. The master bedroom has one queen size bed and a half bath, the second bedroom has one double bed, and the third bedroom has a bunk bed with a double bed on the bottom bunk and a single bed on the top bunk. The third bedroom also has a futon. There are two pull out couches in the living room. 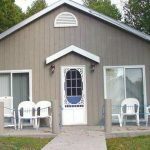 Simple and cozy, this three-bedroom cottage is just right for an overnight stay or a weekend getaway. 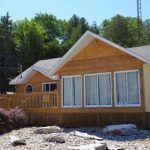 It is only a short stroll from the waterfront Sunset Deck or into downtown Tobermory.